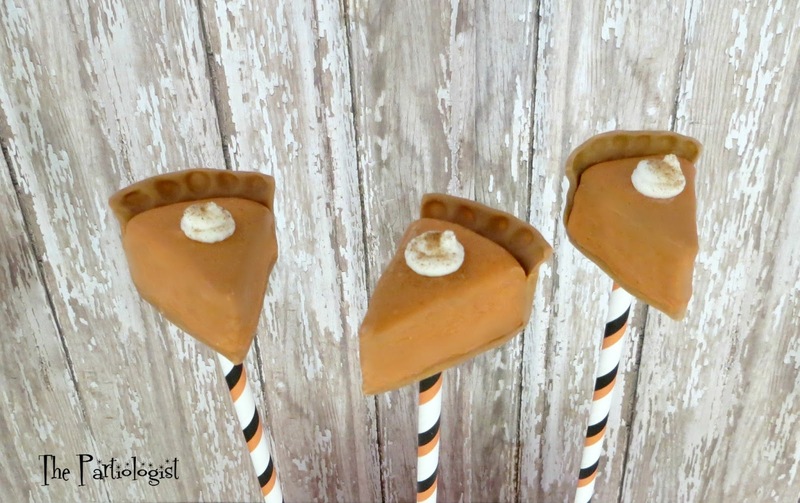 The Partiologist: Pumpkin Pie Cake Pops! I know, I know, Halloween isn't even over, I'm just so excited to show you what I did with my pumpkin! In my world, pumpkin pie is not anything I would want for dessert on Thanksgiving or anytime. However, Pumpkin Pie Cake Pops? Yes Please. Three Slices. In all fairness, I should not be the one to judge a piece of pumpkin pie. Mostly because chocolate was around and chocolate trumps pumpkin every time. 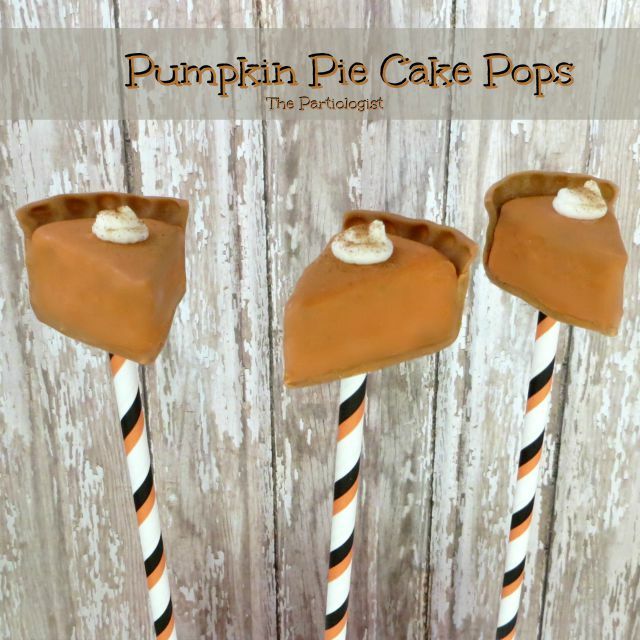 So why would I want to make little pumpkin pie cake pops you wonder? Because I came across pumpkin spice candy melts and thought I should give them a try. 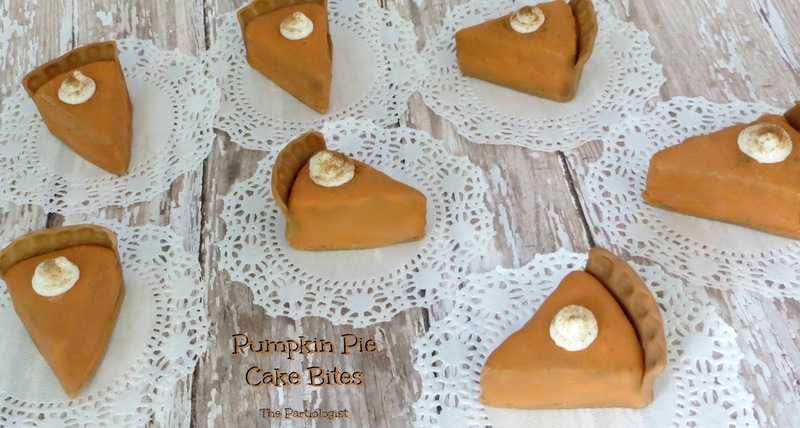 And if you're traveling, you can always serve your pumpkin pie by the slice...on a tiny doily! I'm not for sure, but these might be easier to make then an actual pie. Start by getting your Wilton Pumpkin Spice candy melts. Grab a round 3 1/2" cookie cutter. 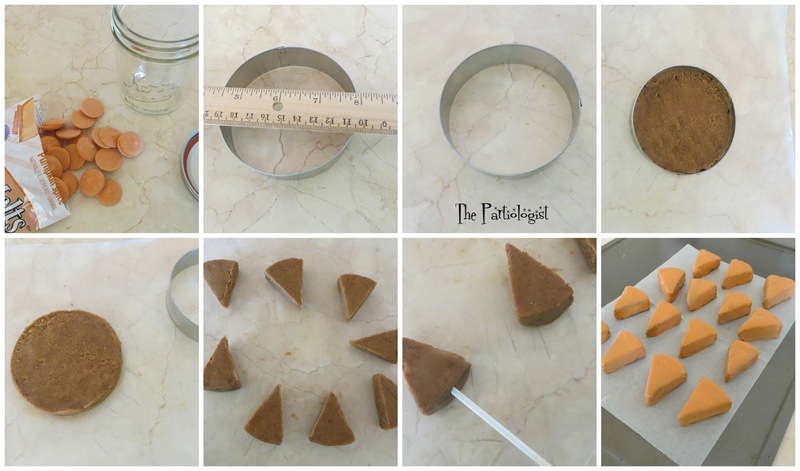 Press the cake pop mixture inside the cookie cutter and remove the cutter. Slice your pie to serve eight. Insert a cookie stick and dip the slice in your melted candy melts. Remove the stick and let dry on parchment paper. Roll out light brown fondant. Lay a slice of pie on the fondant to measure (yes, each piece). Cut around the slice and leave enough to come up the back of the pie slice. Trim the sides off and make sure it is long enough to make the edge. 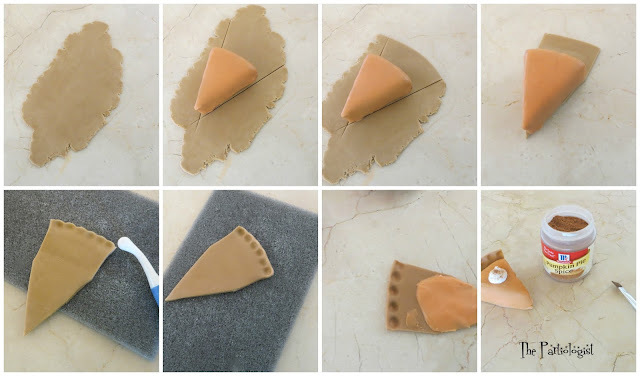 Lay your crust on a small fondant sponge and press with fondant tool. Quickly, add a bit more melted candy melts and top with the cake slice. Add a dollop of white royal icing and a dusting of pumpkin pie spice! You've never tried a slice of pumpkin pie, not ever? Go ahead and give it a try, you might just like it! When I was a kid, I'd take one slice of turkey and a dollop of mashed potatoes for Thanksgiving dinner, oh and a roll. That was it. I couldn't wait until dessert was served. I'd enjoy a piece of pumpkin pie, apple pie, and whatever else was being served. Did I tell you how much I love desserts? Oh my goodness...this is such a cute idea! Oh what cutie pies!! So perfect and I love the sprinkle of pumpkin pie spice. You really should take Beth's advice and try pumpkin pie. I think you might like it!! Maybe this is the year to try pudding AND pumpkin pie - I'll keep you posted! These are the best pumpkin pies I have ever seen! Just the right size!!! Bite size is always a good size! :) Thanks! These are so cute! How fun and tasty! My girls would love them as pumpkin pie is one of their favorites! I know of a lot of little one's who enjoy pumpkin pie - hmmm? Thank you Dorothy, happy you stopped by! These turned out so awesome! I love the tiny pieces of pie and the sticks look great, too! Thanks so much Michelle - I was happy with the result! These are just amazing, wow!!! Thanks for linking up to Monday Funday!! This might be the year I try Pumpkin Pie...but only if someone hides the chocolate! :)Thanks for stopping by Mike! WOW! These are absolutely incredible :) I too am not a pumpkin fan... a true shame b/c my dad grows his own pumpkins to make pumpkin pie! These pops are so beautiful, I'll definitely be sharing them! With all those pumpkins so close, you'll have to be the one to eat the seeds. I do LOVE pumpkin seeds! They are so cute! How did you attach them to the stick? Just a dab of candy melt? Yes, just dip the stick into the candy melts before sticking into the cake pop. Thanks! So amazing! I may have to make these along with the whole pie for thanksgiving!! Thank you so much for sharing!! You're very welcome, I hope you give them a try! They are delicious - you've got to try them! I'll be sure and keep you updated if I try the pumpkin pie! You wrote to remove the stick to let the candy melt dry, but how would you reinsert it? Or do you leave it in and just work the fondant crust around it? I removed the stick from the end of the cake after I dipped it. Then after I had the fondant crust on, I inserted another stick in the bottom (start with the pointed end of a wooden skewer to make the start of the hole, then insert stick) Hope this helps!